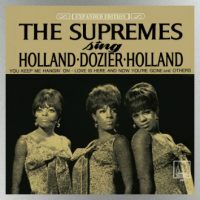 Motown/UMeAn expanded and remastered 51-track version of The Supremes‘ 1967 album The Supremes Sing Holland-Dozier-Holland will be released June 29 as a two-CD set and digitally. The collection features mono and stereo editions of the original album, various extended and alternate mixes and versions, and a live concert performance by the legendary Motown trio from ’67. The extra tracks include extended mixes of “You Keep Me Hangin’ On” and “Love Is Here and Now You’re Gone,” as well as extended versions of “You Can’t Hurry Love” and other Supremes hits. The live performances were recorded in May 1967 at the New York City club The Copacabana at one of the final shows by the original Supremes lineup of Diana Ross, Mary Wilson and Florence Ballard before Ballard left the group. That show featured a medley of earlier Supremes hits, another medley of show tunes, and full renditions of “You Keep Me Hangin’ On,” “I Hear a Symphony,” “You Can’t Hurry Love” and more. The reissue comes packaged with two booklets, one featuring a new essay, rare photos and a new interview with Dozier, and the other a replica of The Supremes’ 1967 tour program.